The estate has its roots beginning in 1919 when Xavier Richard purchased the adjacent properties from his neighbors, but it wasn't until his son Jean Richard took over did they begin concentrating on wine. In fact, by 1947 the domaine cultivated a local reputation in the area for its wines and by 1976, Pierre Richard continued the family tradition extending the property to Mantry where a former hill of vines has been reclaimed. Situated in the heart of the Jura, between Seille River and Lons le Saunier, the soils are perfect for white wine making and the vineyard plots have names that reflect on their past uses: "Les Charmes", "La Croix du Gyps" ... etc. But the domaine is small, encompassing only 9 hectares between the communes of Le Vernois, Voiteur and Mantry. After studying viticulture and oenology at Beaune, taking jobs in vineyards of St. Emilion and Cotes de Provence, Vincent returned to take over the family domaine in 2009 and follows in a long tradition of organic practices in the making of his wines. 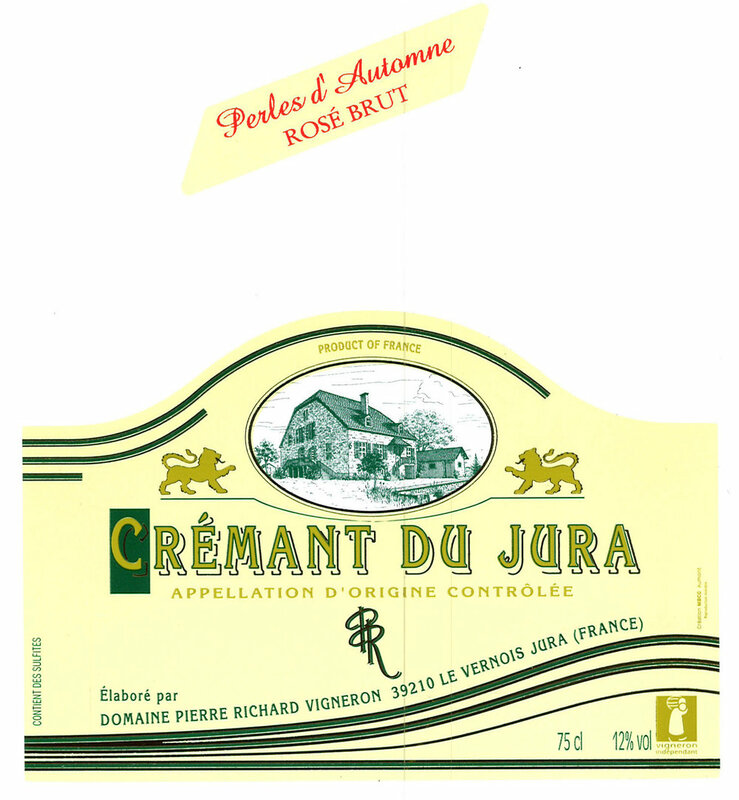 Crémant du Jura, Rosé Brut, "Perles d'automne"
The vines are grown on gravely-marl soils, hand-harvested only, undergoes selective sorting, and with primary spontaneous fermentation occurring in stainless steel tanks for 10-15 days. The wine is kept on the lees for 15 months with no battonage. The blending and bottling are done during the following year's harvest. Aged for 12 months on lees in the bottle before disgorgement. 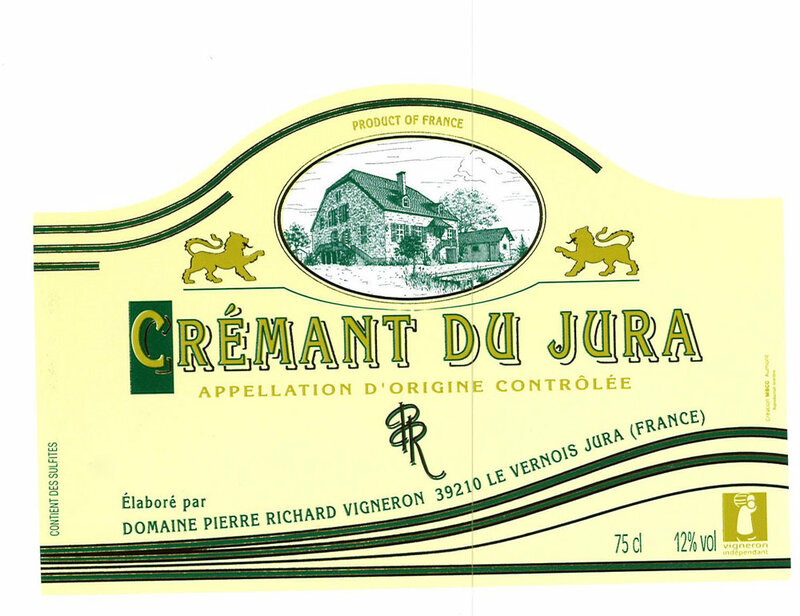 Crémant du Jura, Blanc Brut, "Harmonie"
Vines are grown on clay and limestone soils and are hand-harvested only. Primary fermentation occurs in stainless steel tanks. The blending and bottling is done during the following year's harvest. Aged between 24-36 months on lees before bottling and disgorgement. Côtes du Jura, "Les Marnes"
Grown on clay and marl soils, these low yeilding 25 year old vines are selectively hand-harvested and allowed to macerate for 10 days, followed by 12 months in stainless steel giving aromas of wild sloe, fresh strawberries with underlying animalistic aromas. Predominently grown on gravely soils, these 25 year old vines are undergo selective harvesting before being macerated for 2 weeks. Fermentation and aging takes place in stainless steel vats for 18 months produces morello cherry, blackberry and spiced aromas. Grown on grey and blue marl soils, the vines average around 40 years and are situated on the best site. Selectively hand-harvested followed by typical winemaking techniques before the wine is aged "sous voile" in oak barrels for six-years-and-three-months. The result is a bouquet of fresh walnuts and grilled almonds, dried fruits, a dash of nutmeg, clove and pepper spice to wrap up the complex finish.